Cute wallpaper. The imagery is so Yotsuba! but the whole wall itself is really cute, and the text is adorable. i know you went through hell on this one, but it came out nice and smooth. damn you kozu for stealing my luves taters away! *gurgles* I saw your post and so I came here... It's adorable! =O this wall is like teh sheeet! >XD ahahahaha! Nice and cute wallpaper ! So adoreable ! Great work on this ! I love it ! I really like the simplicity of this wallpaper. It goes well with the simplicity of the scan, along with the cuteness of the series. I like the flowers especially. Great job! 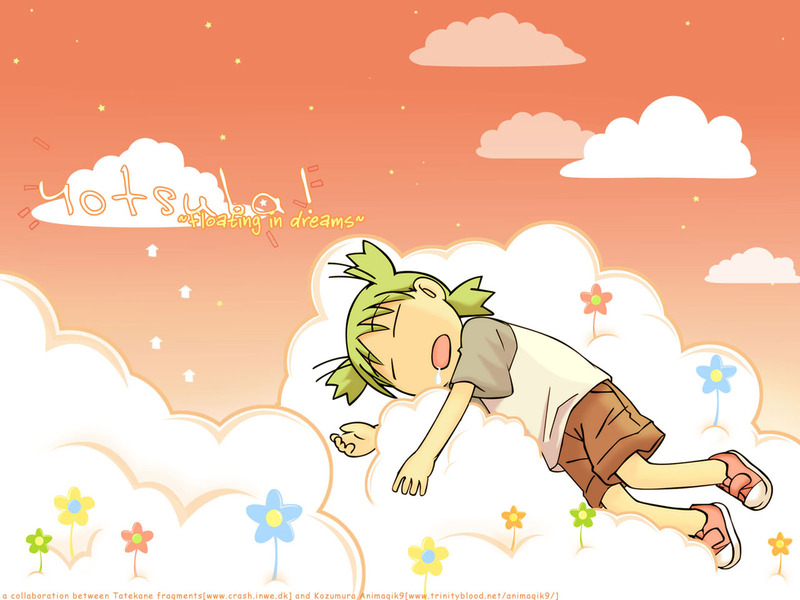 Yotsuba rules! It's hilarious. That goofy position is soooo her. The soft colors and child like elements fit well with each other and her. Th only thing I might change would be the type used for "Yotsuba". It might look better with the large block san serif type kinda like the title on the manga. Other than that, it's totally cool. This is adorable! There is something incredibly calming about those colours. awww..thats soo cute..my sis would love it..
clean, cute and very original. Great theme that came together on this one, the character, the colors, the clouds. Excellent job. Oh wow. I love this wallpaper! You really did a great job. Fits the series nicely. Light-hearted. Moreover, the vector job is amazing. i love the orange in this wall...making it looks so warm and cuddly. really love ur wallie >< just add it up to my fav list ! Beautiful wallpaper! I like much the work of the vector image, the work at heart, and the clouds with flowers! Very pretty! She look so adorable!